Kill a powerful miregaunt and collect some antiquities. Bolu of the Dead-Water tribe, called the Naga-Kur in the Argonian tongue, wants me to go to the Echoing Hollow and accomplish the task he set before me. Head to Echoing Hollow and kill Walks-Like-Thunder. Gather some antiquities from the cave. Return to Bolu for your reward. 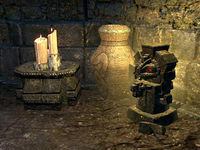 I should go to the Echoing Hollow to gather Argonian antiquities for Bolu. While I'm there, I should also kill the Hollow's guardian, Walks-Like-Thunder. Finishes quest I gathered Argonian antiquities and killed Walks-Like-Thunder. I should return to Bolu and claim my reward. This page was last modified on 18 December 2018, at 01:16.